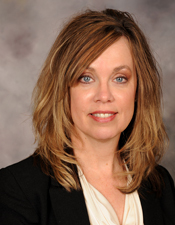 Blog author Professor Tonya Krause-Phelan is WMU-Cooley Law Review’s Legal Consequences of Police Militarization Symposium moderator. Professor Kraus-Phelan teaches Criminal Law, Criminal Procedure, Defending Battered Women, Criminal Sentencing, and Ethics in Criminal Cases. She assists with the West Michigan Defenders Clinic and coaches national mock trial and moot court teams, and is frequently appears as a commentator on numerous radio, television, print, and internet media sources regarding criminal law and procedure issues. As a Criminal Law and Procedure professor, I spend a great deal of time discussing our criminal justice system with students. Judicial opinions, laws, and personal viewpoints have shaped a legal system that pits the need for effective law enforcement against the need to uphold personal rights and civil liberties. Sometimes the system balances these needs successfully and sometimes it does not. An example of how wrong things can go happened in Ferguson, Missouri. On August 9, 2014, officer Darren Wilson killed Michael Brown. As people began to protest the shooting of an unarmed citizen, the world watched in real time as police, dressed in full tactical gear, responded to the protestors driving armored tanks, carrying assault rifles, and using snipers and canine teams to control the crowds of unarmed protestors. The Department of Justice’s Office of Community Oriented Policing Service investigated the way the Ferguson Police Department handled the protests. It concluded the tactics used by police in Ferguson escalated the tensions between the community and the police. As a result, a national conversation began about how—and when—our civilian police forces began to look like soldiers going to battle instead of law enforcement officers serving and protecting their communities. The national spotlight continues to shine on current police practices and the manner in which police departments across the country receive military training, vehicles, and equipment from the federal government. Questions remain, however, as to a solution that allows law enforcement to perform their jobs in a way that serves and protects the community without looking like an army trampling civil liberties. As part of its annual symposium, our Law Review provided a platform for national experts, law enforcement, lawyers, and community leaders to discuss the consequences of police militarization and to explore possible solutions. Despite their differing perspectives and professional experiences, the panelists engaged in a frank conversation about the impact violent crime has on law enforcement, the negative and disparate effect police tactics have on minority communities, and the need for lawmakers and judges to address the injustices that are happening as a result of police militarization. 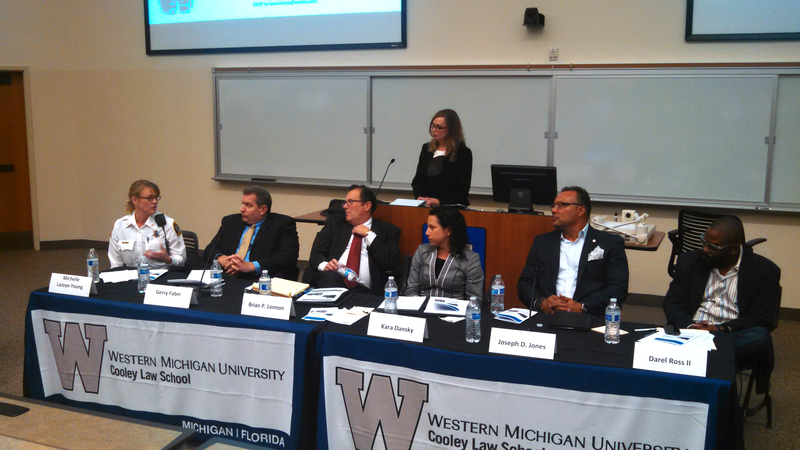 Panel speakers from WMU-Cooley Law Review Symposium discuss their opinions on the use of equipment by police. From left to right, Michelle LaJoye-Young, Gerry Faber, Brian Lennon, Kara Dansky, Joseph Jones, Darel Ross, and moderator Tonya Krause-Phelan. I was humbled and honored to serve as the moderator for this critical discussion. Not only was this an important conversation for the public, it was a meaningful way for students to see how the lessons learned in the classroom have real world consequences. The audience, which included law students, police officers, lawyers, professors, and members of the community were genuinely engaged. The panelists were passionate, instructive, and thought-provoking. At the conclusion of the event, panelists and guests agreed that the conversation about police militarization needs to continue. To that extent, discussions are under way to host another forum. Some of the panelists expressed an interest to return for a second round of discussions. I am hopeful that in the next phase, the law school can partner with Western’s Sociology and Criminal Justice programs to not only further the discussion, but to engage in meaningful work toward offering suggestions toward effective policy change.